Owing to the strong demand for industrial gloves from several end-user industries, manufacturers operating in the global industrial gloves market resort to product innovation in order to sustain the high competitive rivalry. In 2015, the top four players accounted for approximately 77.0% of the overall market, finds Transparency Market Research (TMR) in a new study. “The leading players are investing heavily in research and development activities to improve their product portfolio,” says TMR’s lead analyst. 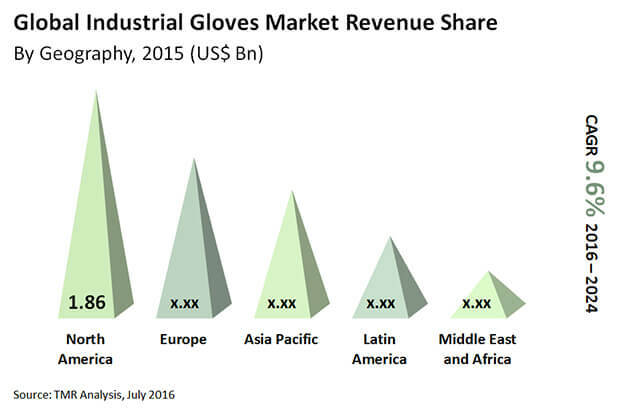 The top four manufacturers in the global industrial gloves market are Showa Group, Ansell Ltd., Honeywell Safety Products, and 3M Corporation. The valuation of the global industrial gloves market was US$5.13 bn in 2015 and is poised to rise at a CAGR of 9.6% from 2016 to 2024, reaching US$11.01 bn by 2024. On the basis of product type, disposable gloves accounted for the leading share in the overall market revenue in 2015 and is expected to retain its leadership until 2024, representing 87.9% of the overall market. The demand for disposable gloves is primarily propelled by its low cost compared to re-usable gloves. Another key factor fuelling the growth of this segment is the recurring purchase of disposable gloves. Furthermore, the demand for these gloves is likely to rise in the pharmaceutical sector in the wake of the increasing need for prevention of fatal infections. Owing to these factors, the segment is estimated to exhibit a noteworthy CAGR during the forecast period. Geographically, North America will continue to dominate the market in terms of revenue until 2024, reaching a valuation of US$3.57 bn. Strict regulations mandating the use of industrial gloves are promoting the growth of this market in North America. The flourishing growth of the healthcare and food sectors in the U.S. is bolstering the growth of the region. The Asia Pacific region will expand at a CAGR of 11.9% during the same period. The growth of this region can be attributed to the increasing awareness regarding worker safety, rising foreign direct investment, and rapid industrialization. The primary sectors on the demand side of the industrial gloves market are the healthcare, pharmaceuticals, food and chemicals, and oil and gas industries. The workers in these industries require protective gloves to protect their hands from hazardous chemicals, cuts, and abrasions and in order to maintain hygiene. Moreover, the rising awareness regarding worker safety and the increasing stringency in regulations set by different safety and health organizations are fuelling the growth of the market. “Accidents at workplace have become a significant concern, thus boosting the uptake of industrial gloves,” says a TMR analyst. Since this is a highly lucrative industry, a large number of small and local players are trying to enter the market. To gain a competitive edge over large manufacturers, several local players are manufacturing industrial gloves that are low in quality and cost. The increasing use of locally manufactured gloves across several end-user industries is adversely affecting the overall revenue generation of the market. Furthermore, the lack of awareness regarding the benefits of industrial gloves amongst workers in developing and developed countries is restraining the growth of the global industrial glove market.